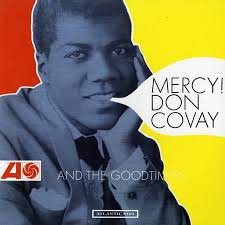 Another pioneer of the rock’n’soul scene left us last week with the passing of Don Covay. My first memory of Covay was when his hit Popeye Waddle was released in 1962, but his legacy and influence actually date half a decade earlier, and lasted a lot longer than the Waddle, which peaked at #75 on the Billboard charts. Covay started his pop music career with the Rainbows, a singing group that also featured Marvin Gaye and Billy Stewart, and in 1957, joined Little Richard as both his driver and opening act. Richard also produced Covay’s first single, Bip Bop Bip. Covay then formed the band The Goodtimers, and also began songwriting in the Brill Building, penning songs for Solomon Burke, Gladys Knight, and Aretha Franklin (Chain of Fools). But, his best know song is probably Mercy Mercy, recorded with the Goodtimers, released in 1964, which peaked at #35, and was covered by a number of artists including the Stones (on Out of Our Heads) and which featured Jimi Hendrix. Covay continued to work with some big names: Steve Cropper and Booker T., Paul Rodgers, and Ronnie Wood (who organized a tribute album for Covay) and others. Similarly, his songs were recorded by a large and varied crowd, including The Small Faces, Gene Vincent, Wanda Jackson, Peter Wolf, Steppenwolf, and Connie Francis. Covay died of a stroke last week, but he leaves some good stuff behind. This entry was posted in history, lawr, Motown, obit, tribute. Bookmark the permalink. I have to say though that the Stones nailed Mercy, Mercy.. The list of covers that surpass the original is not a long list but this is on it. Gene, i too prefer the Stones version of the song, but i thought i would give credit to the source. And, well, it is clear Mick and the boys took a cue from Covay and his mates.